snowdeal.org > ex machina: so long, old man winter? so long, old man winter? old man winter stopped by and dropped 8 inches (20 cm ) of snow in what was hopefully his final appearance for the season. a local person claimed that spring snows around these parts come in "threes", but i'm going to bet against the folksy conventional wisdom and bet that spring has finally sprung. 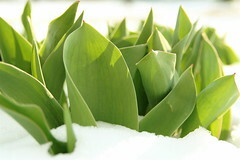 luckily warmish weather made most of the snow quickly disappear so the tulips in our front yard didn't have to endure too much of a beating. maybe it's due to all the walking i've been doing in the frigid temperatures, but this is the first year that i've almost come to understand how people from northern climes decide to become snowbirds.